The first in a series of artworks commissioned for the Barbican’s tricky Curve gallerya 260-foot-long bowed corridor, basicallyTomas Saraceno’s panoramic, thirty-two-screen video installation turns spatial limitation to spectacular advantage. 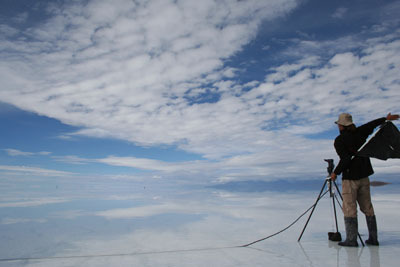 To make the work (part of his ongoing “Air-Port-City” project), the Argentine artist went to the Salar de Uyuni in Boliviaa three-acre salt lake in a desert positioned more than two miles above sea level. There he set up a ring of thirty-two cameras to shoot the sped-up footage of cloud movements, sunrises, and sunsets we see here. After reddening dawns break, the skies fill and empty dramatically; when they’re visible, the nimbi and cirri are low, flying in our faces. We are level with them, which is Saraceno’s intention. As he said in a recent interview, he wants us to consider the idea of living in the clouds, in “platforms or hospitable cells made up of cities that float in the air,” modeled on the peregrinations of gypsies. For Saracenoa trained architect who's currently consulting with scientists about building lighter-than-air vehicleswhether this happens or not matters less than the generation of a new meme: a fluid, fractiousness-fighting conception of national and regional borders. Saraceno may have his head in the clouds, but he thinks his audience should, too; and even if you’re not convinced by the theory, the physical experience of being engulfed by his fluctuating aerial frieze is extraordinary.